I can’t wait til tonight, when I can tell you more about the #onescarfchallenge… but for now let me just say, THIS is what Wrapunzel really is all about! Who else is looking forward to hearing more about the #onescarfchallenge? Can’t wait to share with you all about it, and the woman that created it! ← Why Not Try Four? I really enjoy your wonderful website. I’ve tried a lot of new wraps because of you, and tichel wearing has become a lot more exciting and creative. I’ve written a book about my journey back to Jewish observance, and below I’ve copied out what I wrote about what hair covering does for a woman. It’s from my book I REMEMBERED IN THE NIGHT YOUR NAME (Carobspring Press). Many thanks for bringing more beauty into our lives. The tichel gathers in, and under, what would be flying in the wind. It’s all there. That energy of the hair. It’s still in there under the tichel, but it’s harnessed by the tichel. What’s the use of all that energy if you can’t shape and direct it? Content without form is chaos. The tichel tucks in your loose ends. It makes things tidy. An old woman without a tichel is just a gray, old woman. With a tichel, she’s timeless. 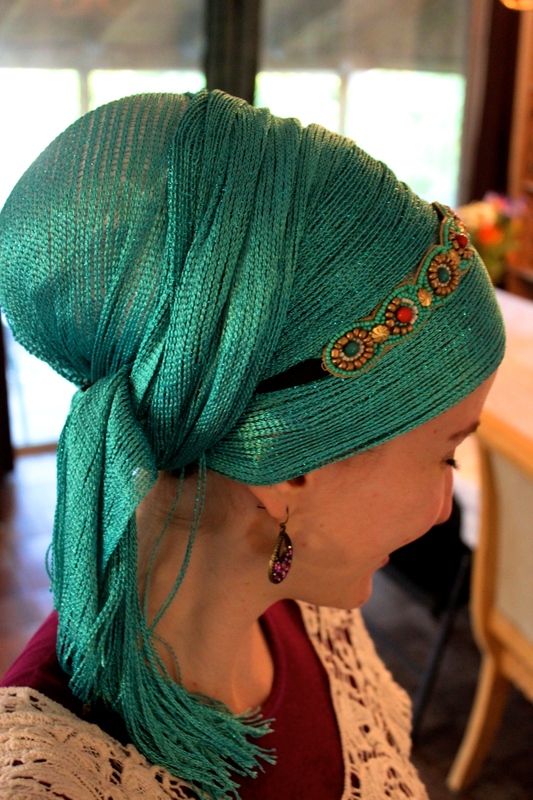 A tichel can serve as make-up without the make-up. The colors against the skin enhance a woman’s beauty. So can the shape of the tichel. During labor and delivery, a woman in a tichel has a measure of dignity that the medical procedures can’t diminish. While she may feel frightened and vulnerable, the tichel is her fortress of safety and prayer. She can dwell there in the midst of the flurry around her. The tichel defines her private space where nothing can touch her. 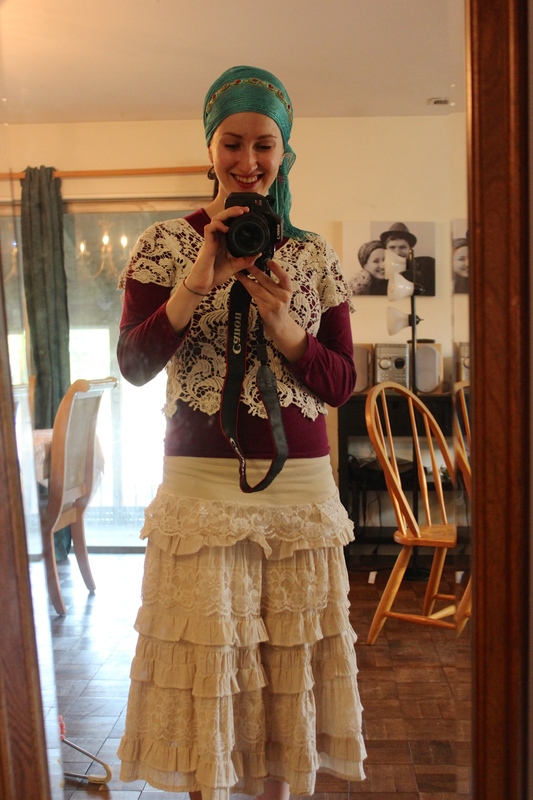 Today there are Jewish women getting married, and they are not covering their hair. They look the same as they did before the chuppah. But the woman who puts on the tichel is transformed. She has changed forever. I’ve looked at the new brides, days or weeks after their marriage. I knew them as teenage girls who came to babysit for my children. Or they lived in the neighborhood and I passed them coming home from high school. Now they are married women, and their status under Jewish Law is equal to mine. I look to see how they’ve changed in such a short time. Yes, the change is dramatic. The tichels frame their faces, and their features are more defined. Everything is in their face and their eyes. They seem more focused, more formidable, stronger forces to be reckoned with. Here is the essential self without distraction of the fluff. The fluff may be there, but it doesn’t stand in the way of me seeing her or her seeing me. The tichel does it, trapping all the loose ends. One might have thought it was an impossible task or that, at least, it would have taken years to accomplish. Not true. The tichel does it in one stroke, and she is utterly changed. I almost always only wear one scarf, plus and accessory. The ombre scarves are my go-to, because they always look like I’m wearing lots of layered scarves. I love the shimmery scarves!!!!!!!!!!!! I have at least one of them. That headband really works for you!! I guess I need to try that kind someday.